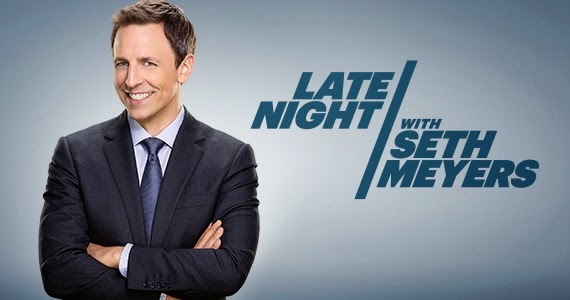 If you've seen the evening talk show, Late Night With Seth Meyers, you may have noticed a recurring bit during each episode called "Fred Talks". After the opening monologue, Seth takes a seat behind his desk and greets Fred Armisen (the band-leader for the show's 8G band). It's during this conversation that we get to see Armisen's comedic mind and improvisational brilliance in action as Fred doesn't know what Seth is going to throw at him. The bit evolves with Seth telling Fred that he overhead him talking to someone (a guest or other crew member) about a typically outlandish story. For instance, in several episodes Fred was "overheard" telling someone that he started a clay-based theme park, or a new exercise craze called "Chase the Donkey". During last Friday night's episode though (episode 28), Fred mentioned that he was going to voice a swimming instructor in an upcoming Pixar movie. Watch along as Fred pieces together his character's story and reveals one of his lines of dialogue, "Get in the water". Although this is clearly Seth and Fred having fun, we couldn't help but pass this along as it gave us a good laugh.